September 25, 2012 (Jackson) - The Far East Broadcasting Company (FEBC)-Korea Children’s Choir and Dr. Billy Kim will visit Jackson for two special performances on October 2 in the Belhaven University Center for the Arts. The morning concert is for Belhaven students and will start early at 10:20 A.M. The night concert is free to the public and begins at 7:30 P.M. 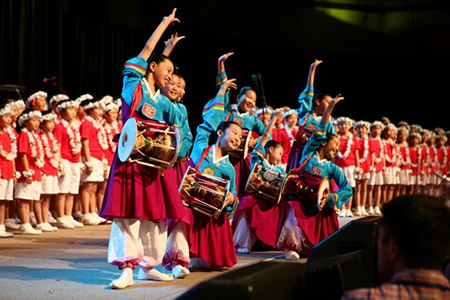 The FEBC Korea Children’s Choir has delighted audiences around the United States with their beautiful voices, colorful costumes, skilled choreography and traditional Korean dance. The choir has performed at Disneyland, Walt Disney World, The Pentagon, Walter Reed Medical Center and numerous churches, colleges, universities and music festivals. Their performances include American folk arrangements, patriotic songs, sacred music and hymns, popular music, contemporary Christian songs and Korean traditional songs. Both concerts will feature the children’s choir and influential speaker, Dr. Kim. The night performance will feature special guests and renowned pianists Sylvia Hong and Michael Rector. The choir will collaborate with Hong and Rector. Hong teaches piano in the Belhaven University Music Department and Rector is a pianist, teacher, writer, lecturer and advocate for classical music; both have performed around the world. International Christian statesman, pastor, broadcaster and influential speaker Dr. Billy Kim has inspired thousands with his story and will speak at the performance. He became the first Asian to serve as the president of the 40 million-member Baptist World Alliance, and built an international media network at Far East Broadcasting-Korea where he serves as Chairman of the Board. Today, his ministry continues to touch thousands of lives through preaching and broadcasting. For more information call 601-968-5919, email mcarroll@belhaven.edu or visit www.belhaven.edu. Belhaven University stands among select Christian colleges and universities and has been repeatedly named one of America’s 100 Best College Buys." The University offers 30 academic majors across a full spectrum of disciplines as well as a variety of graduate programs. In addition, Belhaven has achieved the distinction of being among only 30 universities nationally accredited in each of the major arts – music, theatre, visual art and dance. All programs are taught from a Christian worldview perspective and are guided by the mission to prepare students academically and spiritually to serve Christ Jesus in their careers, in human relationships, and in the world of ideas.